Home /Knowledge Base /Technical /Can I delete a client’s credit report items and start over, change report providers, etc? Home /Knowledge Base /Misc /Can I delete a client’s credit report items and start over, change report providers, etc? Home /Knowledge Base /Client Management /Can I delete a client’s credit report items and start over, change report providers, etc? Home /Knowledge Base /FAQ /Can I delete a client’s credit report items and start over, change report providers, etc? YES, you can definitely delete a client’s credit items that were imported from reports (or were added manually)! STEP 2: Once you’re on the “Dispute Items” page, click the X by each item you wish to delete. OR you can just delete that client and re-add them, for a fresh start. 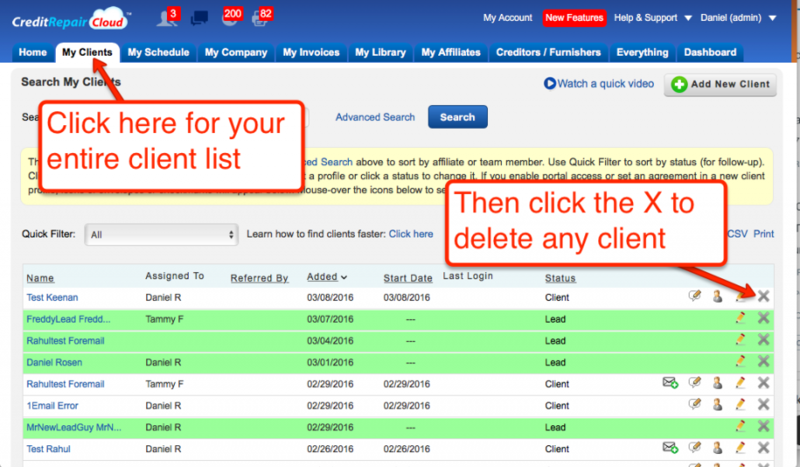 Here’s how: Visit your client list, and click the X by any client you wish to delete. After that, you can re-add them and start over! If not, here are common questions related to deleting client records. Keep in mind, we designed our software to follow a flow. Deleting client records is not part of that flow. 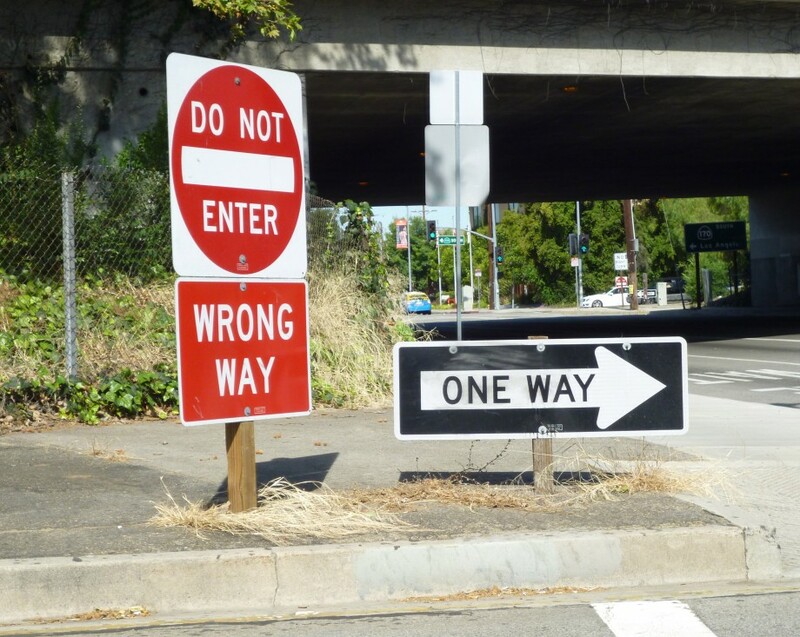 To go against the flow is like driving the wrong way on the freeway. It’s not supposed to happen, and there are laws preventing that (for safety and for your well being). The same applies to software. Whenever you’re doing something that doesn’t follow the recommended flow, you will encounter some limitations, especially when trying to delete records for clients. 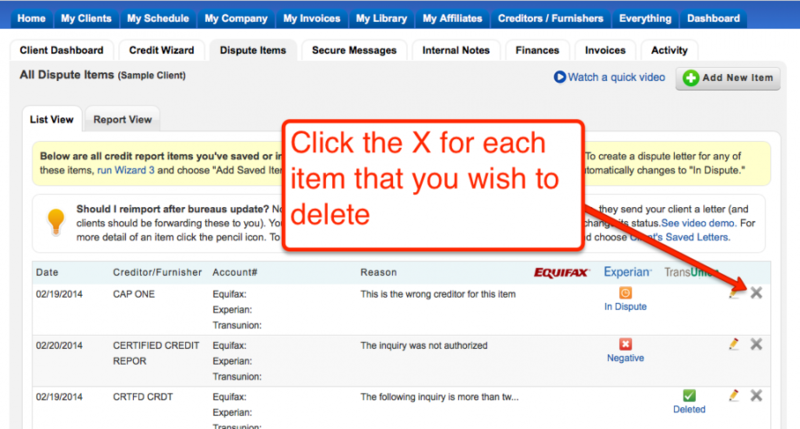 Can I change credit report providers to import from a different company? If you are importing online reports, you can always re-import months later for the same client — but it always would must be from the same provider. We do not have a way to change what you already chose for that client. This is an anti-fraud requirement from the report providers so you won’t have a client who opens 1 free trial after another at other report providers. The client ideally should restart the same credit monitoring account they already had at the same company they signed up with before. 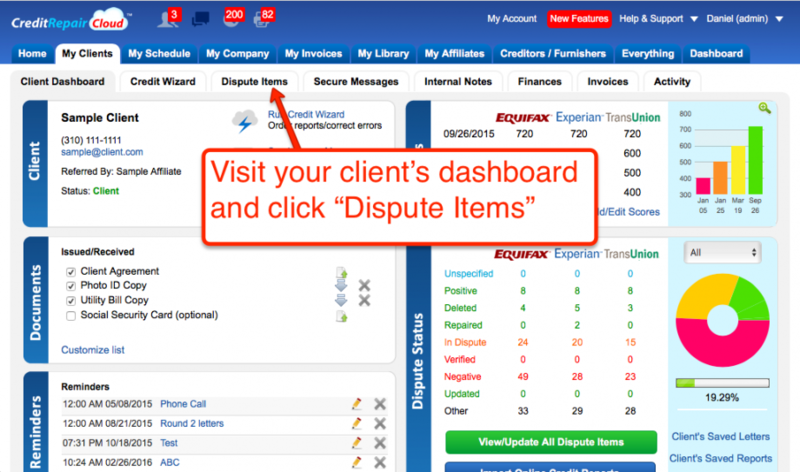 What if my client doesn’t want to pay for credit monitoring? You might explain to them that credit monitoring is an important part of credit repair. What if my client insists on using a different report provider? You can manually add dispute items from any other provider, and in reality, this is usually faster than importing. The best thing about this is that you can use any provider you like and it’s super fast because you are only typing a creditor name like “AMEX” and a partial account number like “XXXXX1234” and you are only doing that for negative items that you want to dispute (and not everything on the report). It truly is faster than importing. Here’s an article about this, and I really recommend reading it Importing credit reports vs adding items manually. What if my client continues to insist on a free trial of monitoring at another provider? These limitations about credit reports prevent fraud and legal issues. If a client is not willing to pay for credit monitoring (which is a necessity for credit repair), they may not be a desirable client. They also may want to avoid paying you. And that can become a far more expensive problem for your business. It actually could end your business. We are here to help you. Need help with Credit Repair Cloud? If you need assistance with your Credit Repair Cloud, please click here to schedule a call! We are here for you! Cheers!